BARRINGTON—Wayne Town Historian Bob Canfield took a group of people on a trip back in history. 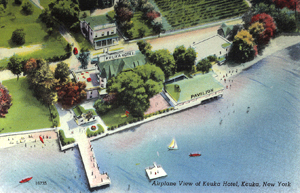 The trip was to the Keuka Hotel, a landmark on Keuka Lake near the foot of Hyatt Hill. The program was presented during the annual dinner of the Dundee Area Historical Society Oct. 5. An old saying is that a picture is worth a thousand words and the program Canfield presented offered a collection of images of the hotel in its heyday. The photos showed a glimpse of a gracious era that ended with demolition of the building in the mid 1970s. The hotel registers were part of a display of artifacts from the hotel. The first names on the first register are very familiar: Rudyard Kipling and Arthur Conan Doyle, both from England. Canfield said the historian’s office has five of the registers. Asked how two such famous historical figures found their way to the site on the lake, Canfield said it was probably a connection to Glenn Curtiss. Curtiss was internationally known for his inventions. In 1912, a widow named Bessie Young bought the property for $30,000. Although she had no experience in hotels, she made it a huge success. One of her innovations was installation of a dance hall right over the water. This was a popular destination for decades and many college students who went on to be famous musicians played in the dance hall during their student years. Rudy Vallee and Fred Waring were two who became famous. A story that has persisted through the years is that Hoagy Carmichael wrote one of his hits, Stardust, while at the Keuka Hotel. After World War II when cars became a more common mode of transportation, dance halls were less popular. The dance hall was shifted parallel to the shore after a flood destroyed the dance floor and the structure served as a roller rink for many years. The hotel with its gracious verandas and sprawling yards continued to be popular until Young’s death in 1974. The property was sold and later the hotel was demolished. Modern cottages now occupy the spot where the hotel stood, just yards from Switzerland Inn. Canfield’s program was the result of efforts by Jerry Lange and Paul Reiser. One of the segments of the program was a film clip of a young bride and groom who visited the hotel after their marriage in September 1939. The bride had been an employee of the hotel. She and her husband stopped to visit Young on their way to their reception at her parent’s home. The bride was present at the Oct. 5 program. Loretta Parshall is now 95 years old. She had a great time working at the hotel, but never got back to the dance hall after her marriage. She said her husband got a job in Rochester and then raising six children did not allow time for going back to the hotel to dance.